I bought this book for my 13-year-old daughter for Christmas this year, because she and I have both enjoyed Clamp's xxxHolic series so much. This is a very thick book, and it contains all four volumes of the series that went out of print for a while, and I was excited to see it was available again. My daughter read it first, and she enjoyed it, but she said to me that she was looking forward to having me read it, so I could explain what had happened. That piqued my interest, and as soon as I started reading, I could see what she meant. The story is a disjointed one, and there is no narrator to help explain things. It is told through traditional comic panels, as well as images and words that are simply displayed on the pages. The speech bubbles are round; sometimes it's difficult to tell who is speaking. There are song lyrics that appear again and again, and it becomes a bit repetitive after a while. The scenes often appear out of sequence, so it took me a while to tease a linear narrative out of all these apparently random scenes and images. And to tell the truth, if I hadn't read the blurb at the back of the book, I would have been even more confused. 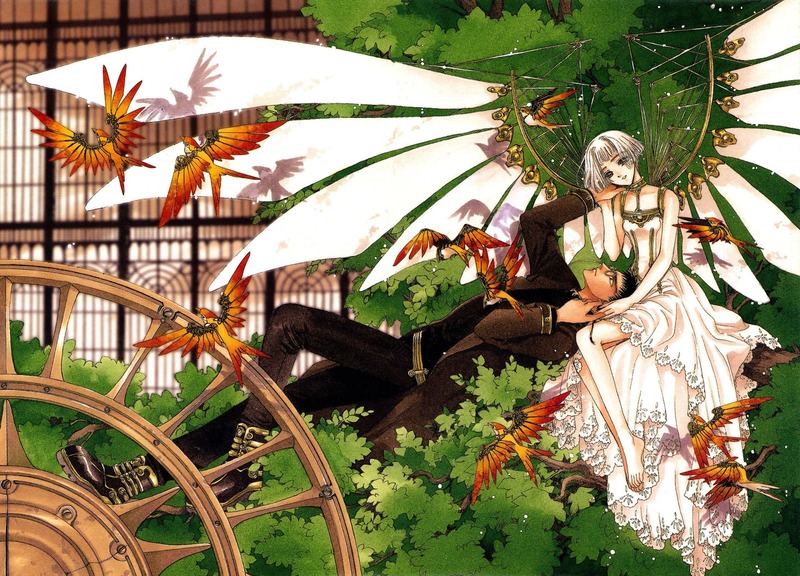 Still, there is a compelling story here, and while it took some time for me to understand the story, it was an interesting one, with characters who, true to Clamp's style, have a lot going on beneath the surface. The setting is a world that is governed by people with telepathic powers, called Clovers. Each level of power is represented by a leaf on a clover, and the ones who govern have three. When a Clover is born with four leaves, their powers are tremendous, and that person must be isolated from society. If they were to decide to wrest power from the governors, there would be no one powerful enough to stop them. I found this premise to be untenable in the context of the story, but I went along with the tale quite happily because it was an interesting one. The first part of the book was the most enjoyable, as far as I was concerned. The last part is more a prequel to the events that happen first, so it felt to me that it was telling a story that had already been told, which sucked out any narrative tension that there might have been. My favorite part of the book is definitely the illustrations. 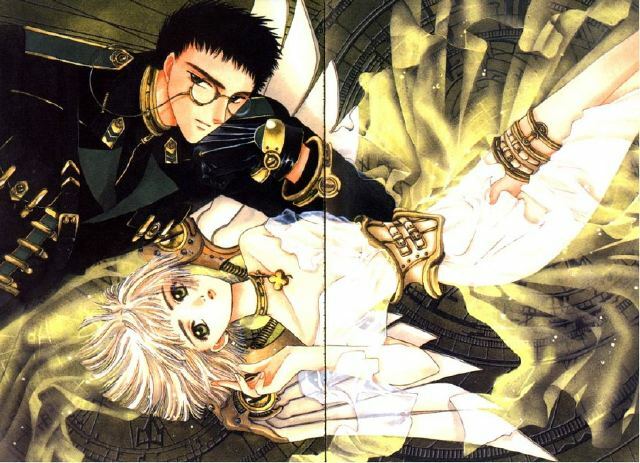 I have always loved Clamp's artwork, the amazing detail, the art-deco-esque approach they take to so many of the drawings. 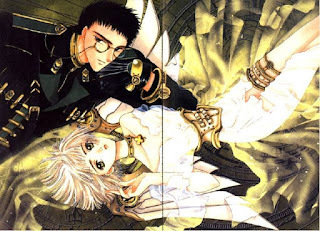 No one does clothing like Clamp, and the cover plates that are included at the end of the book are a visual feast. 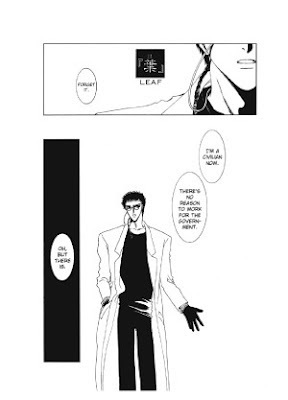 This is not my favorite work by the collective manga author/illustrator team known as Clamp. But it was a worthwhile read, and it is always interesting to look at earlier works by a favorite author. And I think that rereading the book would bring out new and different details that would add to the picture created by fitting all the various narrative and pictorial puzzle pieces together. My daughter and I had a lot of fun discussing the book after I finished reading it, and she had some excellent insights. I would definitely not recommend this to young children - it is far too confusing for that - nor to people who are looking for a good introduction to manga or graphic novels in general. It's a little too confusing and might be frustrating. 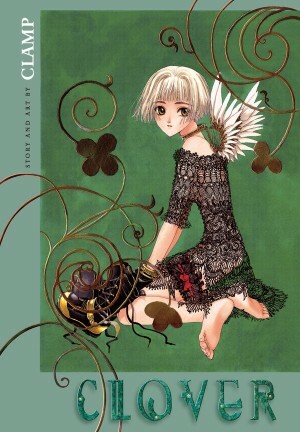 But for readers who enjoy the out-of-sequence narrative, fans of manga, particularly Clamp, and those looking for an unusual, non-predictable science fiction/romance/adventure story, pick up Clover. I'd love to know what you think. I believe we've talked about our mutual love of CLAMP before!! This is one of the few books of theirs that I haven't read, but my ex used to adore this series. I DO love the art in this series...I've flipped through it a few times and it really is stunning! I have the set of 4 GNs somewhere.. this is an incredibly pretty series, and they packaged them with this lovely sort of semi-transparent sleeves over the covers of the books. But the story inside is pretty sad. Very.. doomed and self-sacrificing. But CLAMP seems to have a lot of stories with that sort of thing. Did you ever end up reading Night Circus?? Chris - We certainly have! This one is a keeper just for the art. I did enjoy the story, but xxxHOLIC is still my very favorite. And by the way, I finally did get to watch the anime series, and it is just as good as you said. Thanks for that tip! Janicu - They are pretty, aren't they? But yes, it is a pretty sad story. Not as much of the humor that I enjoy in their more recent work. VA Gal - You know, the fact that you didn't really like it had me putting it on the back burner. Do you think I should still give it a try?